I recently had cause to write to my local MP, Hazel Blears, with reference to the shocking decision by the Financial Services Compensation Scheme to deny Christies Hospital a refund of £6.5m of donated money that was lost when two Icelandic banks collapsed. Whilst I did expect a standard reply, penned by one of Ms. Blears’ minions – I did not expect to open the reply and see her picture greeting me whilst I tried to down my ready brek this morning. 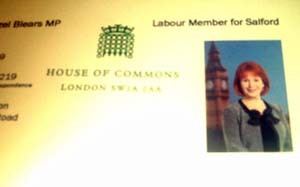 Is Hazel Blears really so vain she needs to include a photograph of herself on all official correspondence from her parliamentary office? It was the last thing I needed to see this morning whilst I tried to digest my breakfast!